First of all, what is a “landing page”? Did you ever click on an advertisement in Google and get taken straight to the advertiser’s homepage? If you are running a digital marketing campaign – whether it is ads on Google, Facebook, or spreading the word via social media – you want to send visitors to what’s called a “landing page,” NOT your home page. A landing page is a special page designed for the sole purpose of getting visitors who come through a specific marketing campaign to perform a particular action: buy, contact you, sign-up, etc. They click on your ad, “land” on this page, and hopefully don’t leave before they accomplish your goal or complete your call to action. For that reason, the landing page needs to be very strategic. 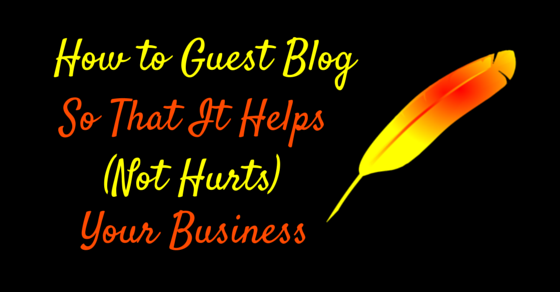 You went to all the trouble of identifying, targeting and motivating your ideal client, right? 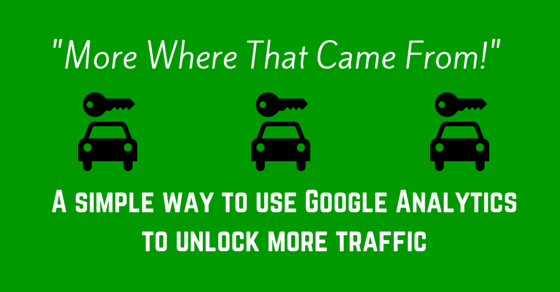 And they clicked through to your site (success!) Don’t waste their visit to you! Give your potential client all the information she needs to accomplish your goal – and don’t give her anything else that would distract her. If you run an exclusive, high-class guinea pig grooming spa, and you want your site visitors to contact you in order to book a stay for their precious guinea pig, send them to a landing page that is targeted toward people who have already decided to vacation and are debating about what to do with their darling pet while they are away. Describe how you have a staff member dedicated to each and every pig, how their beloved pet will be munching on gourmet organic vegetables, how his paper shavings will be changed twice daily. Give testimonials from enthused (deranged?) pet owners who have boarded their guinea pigs with you. Talk about your special Book 3 Nights, Get the 4th Free offer. End with a contact form or a live chat option to speak to a representative. That’s very focused on the goal, right? Your goal is to book guinea pig spa visits – you targeted the right audience and pitched them your product effectively. But if you send them to your homepage, they will have too many options. They may decide to click on your Guinea Grooming Guide – or check out the recipes in your Gourmet Guinea Goodies section. Will they notice your testimonials page in the main navigation menu? 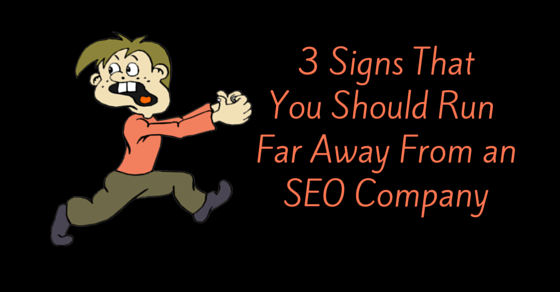 There are WAY too many places they could get distracted and end up leaving your site without seeing the information you want them to see – and taking the action you want them to take. So you need a landing page for each advertising campaign. 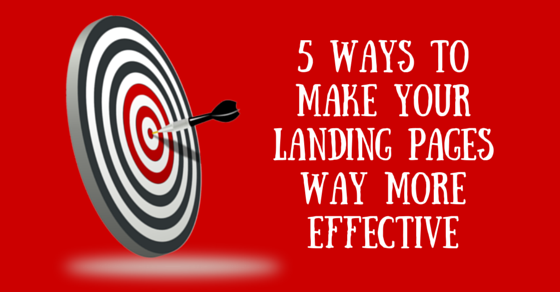 Once you have a landing page – or better yet, once you’re designing a landing page – how can you maximize the effect so that your visitors will take the action you want them to take? This does not mean you MUST take off every spare pixel aside from your marketing copy. If having the main navigation will help them appreciate your site and offerings more, leave it. Just make sure that there was an informed decision made. Otherwise known as “social proof,” otherwise known as “mob mentality”, otherwise known as “if everyone jumped off a bridge” … well, maybe that’s a little extreme. But we human beings are social creatures, and we look to see if other people are doing something before we do it. If there is proof that many people, discerning people, people we relate to are doing it, chances are we will do it too. If I see that other people trust you, and why, it increases the likelihood that I will trust you. Make your pages long. Imagine that you’re selling your product face-to-face. Write down what you would say – maybe even record it. Get all that information onto your landing page. After all, in a face-to-face sales meeting, you get to answer their questions and objections. On a web page, they may not stick around if there are questions and objections. Try to preempt them. Don’t worry about boring people with all your text. If people are interested in what you’re saying – they’ll keep scrolling. Just make it relevant and captivating – and make sure they realize there’s more information. This tip goes hand-in-hand with the last one. Especially if you have a long page, give them multiple times over the course of reading the page to perform the desired action. Have your “call-to-action button” (where it says “Get Your Free Quote Now” or “Sign Up Today” or “Start Your Free Trial”) after every section of your text. 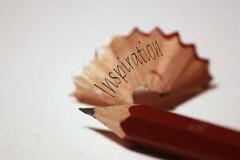 One good example of most of these tips is http://diythemes.com/ – the Thesis Theme page for WordPress. Ironically it is actually a homepage, but it’s super-targeted and well-designed – with lots of text and multiple calls to “See Which Thesis Option Is Right For You.” Down by the bottom they show all the movers and shakers who use Thesis. One fantastic resource for conversion tips on landing pages is the Conversion Rate Experts website. Case studies, articles – well worth a read to get your conversions up. If any of these changes get your conversion rates up, share your successes with us in the comments. I love WordPress. I do. Part of my love could stem from the fact that the other content management systems I’ve had exposure to were clunky, proprietary programs that drove me insane and hampered my marketing efforts. One of the many benefits of working within WordPress is the wide availability of plugins. Plugins are basically add-ons to any WordPress theme that drastically expand what you can do with your site. They’re built by private developers, who post them (usually free) as a service to the WordPress community. Want a contact form? Want to choose which pages show up in your main navigation – or the order in which they appear? Want to eliminate spammy comments before you even see them? Most themes will usually come with a few plugins installed already, but here are my recommendations for plugins that will make your job as a site manager SO much easier. This list of recommended plugins can be divided into two categories – those which help with on-site tasks and those that help with off-site tasks. By default, whenever you make a new top-level (no-parent) page, meaning it’s not a sub-page (think A B or C in high school English class outlines – not 1, 2 or 3 under A, B or C) WordPress places that page in your top-level navigation menu. That’s great if it’s the About page, or the Contact page, or My Services page. It’s not so great if it’s the “Thank You for Contacting Us” page, or another page that you don’t want on your top navigation bar. Enter the “Exclude Pages” plugin. It adds a little box to the right of “Edit Page” under the boxes with publishing options and page attributes box. By default, the box is checked, which means the top-level page will show up in your navigation menu. But all you have to do is uncheck it, and voila! The page vanishes from navigation. Simple – but critical, in order to avoid overcrowding your navigation and confusing your visitors. WordPress has a built-in way for you to select the order of your pages by assigning a number to each one in the Edit Page view. But if you ever add a new page, you have to go back and reorder each one… slow and clunky. So in comes the Simple Page Ordering plugin, which once installed enables you to choose the page order by just dragging and dropping the pages in your “All Pages” menu. Want your About page to come before your Services page? Just drag it to above the Services page entry. The end. For you to perform effective SEO (search engine optimization), you need to be able to select your page’s title tag (the title you want showing up in Google Search results, and one of the factors by which Google will rank your site.) The title tag may be different than the title you want showing up on the actual page within your site. For example, let’s say you run a site devoted to peanut butter and jelly sandwiches. You may want your recipes page to say just “Sweet and Sticky Variations” at the top. Clearly, everybody there knows you’re referring to PB&J’s, so there is no need to point it out within your site. However, for keyword search purposes, you want Google to know you’re naming the page “Peanut Butter and Jelly Sandwich Variations” so the right searchers can find you. Some themes have places where you can define the title tag (often called Title Tag or SEO Title), but in case yours doesn’t, you’re going to want one of the plugins up above. For a rundown on the differences between All-in-One and Yoast, see this blog post. But bear in mind that it may have been written before the All-in-One SEO update described in this post. Want people to be able to share your great content on their social media accounts, easily? Both of these plugins create social media sharing icons – with an up-to-date count of how many people have shared your post on each network. Really Simple Share buttons appear above or below your post (or both). 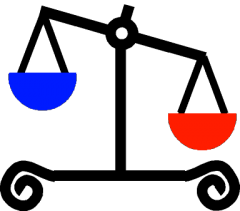 This site uses Really Simple Share (scroll down to the bottom to see it – you can even test it out. 😉 Digg Digg buttons appear floating to the side of your post. That’s about it. A picture is worth a thousand clicks. Links shared on social media that come with an image look more attractive and compelling than just a text link and description. So how do you get those images to appear on a Facebook share? Facebook has a specific coding protocol to find the images. This plugin puts all that code automatically into your site. All you have to do is install it, set it up with your Facebook user ID (it will give you directions), and then make sure you add a featured image onto each page or post. Facebook will then automatically pull that image for sharing. Bonus plugin: Gravity Forms. I didn’t include this on the main list, because this is a paid plugin, not a freebie. Gravity Forms is a plugin for making forms. It’s a super intuitive tool to build contact forms and to decide how you’ll get notification and what the users will see after they submit the form. Just a pleasure to use. It does come with a price tag – $39 per site for a one-year license (if you don’t renew, your forms will still work; you just don’t get upgrades and new developments). A popular free contact form plugin – Contact Form 7 – doesn’t even come close. If all you want is a simple contact form, it’s probably enough, but for anything more than that… worth investing in Gravity Forms. Any other plugins you think are critical to your site’s functioning? Let us know in the comments below! We didn’t grow up with cable TV. That meant we got 6 channels (my father said that he had children so that he wouldn’t have to buy a remote control – it was my job to stand at the TV and change the dial) – and one of them showed The Wizard of Oz once a year, on a Sunday, at 8 p.m.
Wizard of Oz Night meant popcorn and a bedtime suspension, which was major. 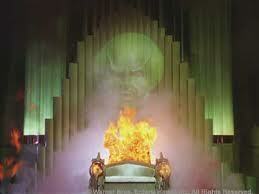 Believe it or not, my favorite part of the movie did not include flying monkeys or red ruby slippers. My favorite part was at the end, when the special-effected (c’mon, it was super advanced technology for 1939 when the movie was originally released) giant Oz head image, ripe with fire, was exposed to be a blithering old man behind a curtain, manipulating images and sound. The discovery titillated me every time, cultivating a young conspiracy theorist. Fast forward 30 years and I have unearthed today’s Great and Powerful. I just finished a 2-session, action packed Google Analytics course at the esteemed local web marketing and development studio, Illuminea. I am now more confident than ever that Google knows everything. I suppose I’m not the first to embrace this concept, especially now that everyone is up-in-arms over Google tattling on all of us to the NSA, but still – I’m impressed. Today, I will start slowly by introducing you to some of the terms required when dealing with analytics. Bounce Rate: The most simplistic explanation (sanctioned by The Goddess of Google Analytics, Menucha): the percentage of people who entered your site (not necessarily on the home page – it could be on any of the internal pages) viewed that one page, and didn’t click anywhere else on your site. They landed on one page, and basically died there, eventually closing the tab/page/browser hours later. Bounce rate also reflects anyone who landed on your site and immediately x-ed out of it, or hit the back button without navigating to any other pages. Want a more techie explanation? Look here. Keep in mind that while I detest the titles Ninja, Guru or Thought Leader, this guy certainly knows what he’s talking about. 404 Error Page: the page you get to when something is broken – a link that goes nowhere, a page that used to exist but doesn’t any longer, that type of thing. The recommendation, by the way, is to make sure that you have formatted a 404 Error page (in case a mistake is made somewhere along the way) that directs your visitor to a live, working page within your site. Doing so in a creative manner (like this) earns extra points, since you don’t lose the visitor entirely. Goal: Without goals, your analytics and data mean nothing. A goal is a conversion – its is your website visitor going where you want him to go, doing what you want him to do and the place he lands after completing your call to action (making a purchase, downloading an ebook, filling out a contact form, donating funds.) A goal can be a destination (a certain internal page on your site) a duration (how long someone spends on your site) or pages per visit (how many screens or pages the visitor navigated to before leaving). Next time, I will walk you through some of the basic reporting features in Google Analytics, how to use them, and what we can learn from this data (in real life, the changes we need to make and the tweaks to bug your web guy about). But as Chaya Leah mentioned a few weeks ago in her informative post, “Crafting Your Message: A Three Point Plan For Web Content Writing,” writing fabulous, keyword rich content is only part of the plan. An important part, but only a part. So before you go and set up a blog and start churning out post after post, let’s take a few minutes and learn some basic SEO –Search Engine Optimization – (read: how to get your posts to show up in an actual Google search by actual people). Otherwise your King Content may turn out to be a ruler in exile. Romantic? Maybe. Effective? Not really. Step 1: Are people actually looking for my keyword? Starting keyword research was covered in last week’s post, but we’ll go over it again here for the sake of fluidity. Create an account with Google Adwords to use their Keyword Planner tool. They don’t take any credit card info from you unless you want to actually start running an ad campaign, but you can use all the tools to do research, practice setting up ad campaigns, etc. You should get a chart with two tabs: Ad group ideas and Keyword ideas. The Ad group ideas are helpful because they break the keyword list into topics for you, so you don’t have to filter through too many irrelevant words. Go through either tab, and you can click the arrow on the far right of any keyword to add it to a “Your Plan” list that you can export at the end. Ignore the “Competition” column – that’s talking about advertising competition, and doesn’t always reflect the competition in the organic (non-paid) Google results. A higher number means that more people are entering that particular keyword in their Google search bar. It means that by optimizing for that keyword, you’ll get more exposure. Relevant keywords with high search volume are ostensibly better, but before you settle on one, you’ll have to check how hard it will be to compete for it (how many other people are wanting to optimize that particular word). For example, “iPhone” is entered into Google as a search term 2.7 million times monthly worldwide. If I sell iPhones, it would be great if I could rank well (come up at the top of the page when someone searches) for them. But if I try to rank for iPhone, I’m competing against Apple, Sprint, AT&T, Verizon, Wikipedia… Do I have a chance? Step 2: How hard is it going to be to compete for my keywords? 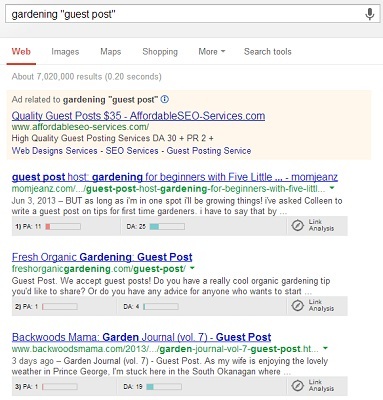 Do a Google search for the keyword you want to check. Before you look at the results, use an add-on like Google Global to get the results specifically for the country where the majority of your searchers are going to be located. a) How strong overall are the ranking sites? How many links do they have from how many other domains? You can get an overview of this information using the MozBar from Moz (formerly SEOMoz) – they’ll give you link metrics underneath every result on the Google results pages. Without paying any fees, the overall metric generated gives you an idea of the page’s strength. Especially if you compare it to your own site’s numbers. 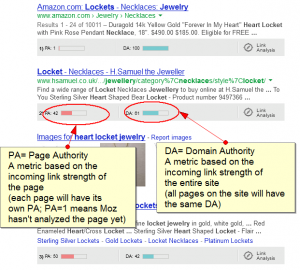 b) How well optimized are the ranking sites for your target keyword? Check if the exact keyword is in the title and in the snippet. If results seem well-optimized (i.e. the keyword phrase is at the beginning of the title, and it seems that it’s on the page as a keyword phrase also based on the snippet), that’s going to make your job in outranking them much more difficult. So you’ve gotten a feel for how hard it’s going to be to outrank (come up higher than) the currently ranking sites for a specified keyword. If you feel you have a fighting chance, now how do you optimize your pages for the best results? Step 3: Where do I put my keywords? This is a specific piece of coding in the back end of every website that visitors don’t see when they view the pages. It’s what shows up as the title in search results, and usually as the text in the browser tab when the page is opened. Most website content management systems will have a place in their administration portion where you can write a title tag and it will be translated automatically into the code by your system. Your keyword should be in the beginning of the title tag if possible (while still making it sound normal and inviting). Also a tag in the code, this doesn’t impact on your site ranking. However, Google will often show the description as the snippet if the searched keyword is in the description. 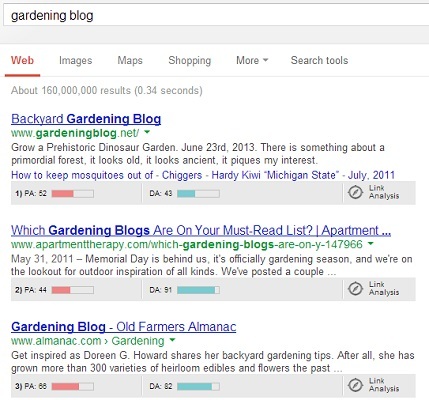 This is your chance to control what the searcher is going to see when he or she searches for your keyword. Write an attractive, engaging sentence or two that will encourage the searcher to click on your site. If you have images, putting your keyword in the “alt” attribute of the image is a good way to add it to the text on the page without making the text sound awkward. If you have other links pointing toward this page, whether they’re on your website (internal), or from other websites (external), some of the text used in the links should include your keyword. Be careful though – don’t overdo this one! Websites have gotten slapped by Google when 60% of the links pointing to their site said “cheap costume jewelry” (or <insert your keyword here>). A good percentage should be linking to you with your domain name or brand name, but if you can get some natural links with keyword text, go for it. 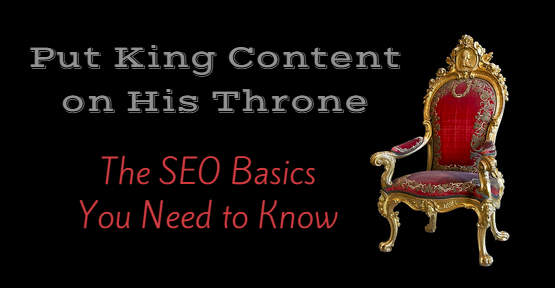 These SEO basics should be enough to get you started bringing your royal content to the eyes of his potential adoring subjects. Good luck – and long live your King!